In part 2 of this article, the procedure to fabricate the catching prongs, fruit basket and how they are joined was discussed. This part discusses the creation of the apple fruit picker pole. Because this apple fruit picker will be transported, the fruit picker pole was designed to be extendable and collapsible. Two poles of 6-foot and 5-foot lengths will be joined to create an 11-foot long apple fruit picker pole. A 2-foot long pipe will serve as a coupling to join the two poles end-to-end. Drill two 1/8" holes on (both sides of) the 2-foot 3/4" dia. coupling (blue pipe). These holes are positioned 2" from the ends of the coupling. Drill with a 1/8" drill bit on the marks. 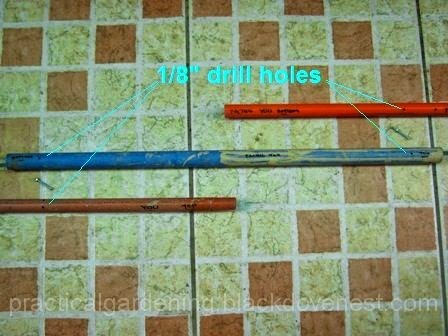 The photo below shows the 2 poles and the coupling with the drilled 1/8" holes. In between the poles and the coupling are the 1/8" dia bolts that will be used to fasten them together. Bolt the 2 poles (6 ft and 5 ft) to the coupling so you will have a single 11-foot long pole for picking fruits from trees. The long pole may be collapsed by removing the 1/8" nuts and bolts. Drill 2 pairs of 1/8" holes on the topmost end of the 11-foot pole. These 2 pairs of holes will allow you to bolt the apple fruit picker head (catch prongs, stem and fruit picker basket) to the apple fruit picker pole. Bolt the apple fruit picker head with the apple fruit picker pole as shown below. Another view of the apple fruit picker head and apple fruit picker pole fastened together. To collapse the entire apple fruit picker for storage or for carry, just remove the bolts on the apple fruit picker hole. Here's the 11-foot apple fruit picker pole in action. Notice how it reaches the fruits on the top branches of the canistel tree. Don't forget to remove the cap of the disposable water bottle (fruit basket). With the cap removed, it is easier to see what's inside the apple fruit picker basket while you are picking fruits. Fortunately, canistel fruits are big enough and won't fall through the cap hole. The fruit basket is also easier to clean with the cap removed. This is not an exhaustive list. Some fruits you can harvest with the fruit picker are: apple, apricot, orange, avocado, grapefruit (pomelo), guava, lemon, lychee, nectarine, mandarin, tangerine, plum, persimmon, peach, passion fruit, pear, pomegranate, starfruit, star apple (caimito), mango, sapodilla (chico), custard apple (atis), mangosteen, cotton fruit (santol), cashew, java apple (macopa), velvet apple (mabolo) and canistel (tiesa). Here's a newer and more efficient version of the apple fruit picker with four catch prongs instead of two.